For 112 days, Carson O’Neill called Rady Children’s Hospital-San Diego home. He was waiting for a new heart. At just 4 months old, Carson was diagnosed with Kawasaki disease, a disorder that causes inflammation in the walls of arteries throughout the body. It is the most common cause of acquired heart disease in children yet the symptoms—fever, rash, irritability—often go misdiagnosed. Local pediatricians thought Carson might be suffering from a food allergy. 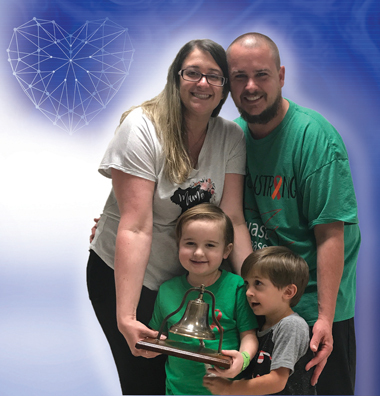 When symptoms persisted, Carson’s parents, Gina and Mike, brought their young son to Rady Children’s where experts determined it was Kawasaki disease. For four years, the family was able to manage the disease’s progression. He seemed to be doing fine. In June, Carson had a massive heart attack. “He was in pain, he turned completely pale and felt clammy, and he vomited in the back of the ambulance,” Gina says. Safely at Rady Children’s, physicians discovered that the entire left side of his heart was blocked. Carson was placed on an ECMO machine, a heart-lung bypass device that oxygenated his blood outside of his body, allowing his tiny heart and lungs to rest. Then, he suffered a second massive heart attack. He did pull through, and once Carson was stable, he was given a Berlin Heart—an external artificial heart that would keep him alive until he could be matched with a donor heart. “He was extremely sick and his body needed support as he waited for the appropriate donor,” said John Nigro, MD, director of cardiac transplantation at Rady Children’s Heart Institute. And the waiting game was intense. Carson experienced a multitude of ups and downs as he waited for his new heart. At one point his body was too frail to survive surgery and he had to be removed from the national donor waiting list. For the more than 230,000 kids who seek treatment at Rady Children’s each year—and their families—the waiting is probably the hardest. Waiting for results. Waiting for answers. Waiting for a heart. In 2015, Rady Children’s launched the first pediatric heart transplant program in San Diego. Innovations in medical care, technological breakthroughs and cardiac research are saving more lives today than ever before, ensuring fighters like Carson get the right treatment at the right time. Nearly four months after he was admitted to Rady Children’s, Carson was matched with a donor heart; he was the 11th patient to undergo heart transplantation at Rady Children’s. “I think he took to the heart pretty quickly,” Dr. Nigro says. So quickly, in fact, that post-transplant Carson was upset to realize that his Berlin Heart had been removed. He had bonded with the life-saving device. Today, Carson is doing amazingly well. He is walking, running and playing beside his brother. He doesn’t remember much about his time at Rady Children’s, and for Gina, that’s perfectly fine. Carson continues his post-operative protocol and will be on medication for life. Some days are better than others and there are moments when having a new heart can take a toll on Carson’s 5-year-old body. But according to Gina, his outcome is simply miraculous. At Rady Children’s we know miracles happen when we partner our best medical and research answers with passionate and generous friends and neighbors who give from the heart. Learn more about Carson's story, featured on CBS.com.